We know climate change can affect our health in a multitude of ways— like by increasing rates of many diseases and temperature-related deaths. But have you ever wondered how climate change might affect humans by its effects on harmful chemicals? This article looks at how climate change alters temperature and moisture, and how this can change the presence, movement and toxicity of chemicals in the environment. Altering the temperature or moisture can create or quicken the formation of certain chemicals and change how chemicals move through the environment. In turn, this can impact our health and that of other organisms on our planet. By 2100, climate change is expected to increase earth’s temperature by 1.8 to 4 ºC (35.2 to 39.2 ºF). Most of the warming will happen at and near the North Pole (Figure 1 (a)). A warmer climate will produce more ozone gas and other toxic chemicals. We typically consider ozone to be good, because it protects us from the sun’s harmful UV rays. But if the ozone at the earth’s surface is inhaled, it can damage our lungs. Increased temperature can vaporize some chemicals, releasing them from soil or water. And it can cause other chemicals to dissolve in drinking water. Melting ice and snow can also release stored chemicals. These activities will increase the number of chemicals we are exposed to. High temperatures can also break down chemicals, either directly by heat or light, or by increasing the activity of microorganisms that attack chemicals. Dependent on the chemical type, the breakdown process can either make a chemical more or less harmful. 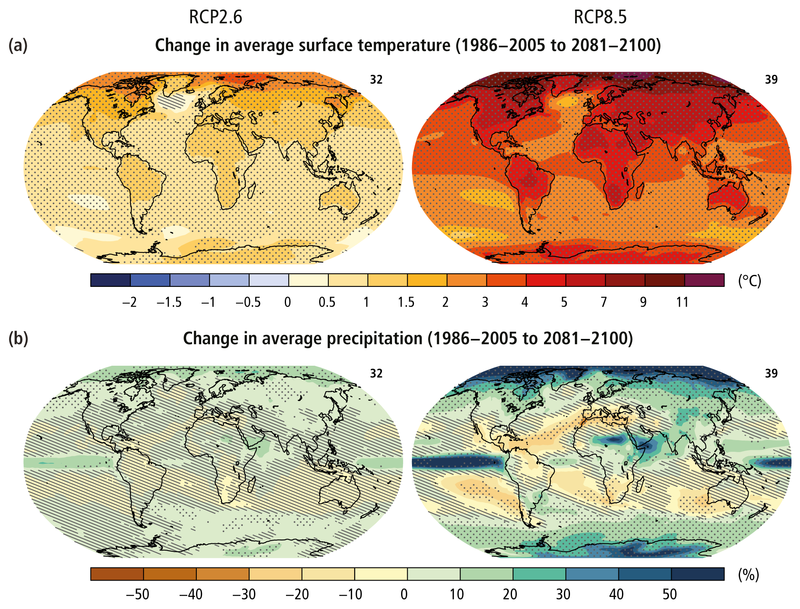 Climate change is expected to increase moisture levels in North and South America, northern Europe, and northern and central Asia. These regions will experience more rainfall, flooding and storms. Moisture levels are expected to decrease in southern Africa, central America and the Mediterranean (Figure 1 (b)). This will cause substantial droughts. On a global scale, the ozone layer can be destroyed by high moisture and high temperature. Low moisture conditions will produce toxic air particles while high moisture will cause chemicals in the air to drop to the ground via rain (i.e., acid rain) or snow. Also, more chemicals can dissolve in water bodies if moisture levels increase and correspondingly, more will bind tightly to soil and persist longer if moisture decreases. High moisture levels will also hasten the breakdown of chemicals. Figure 1: Earth’s average predicted temperature (a) and moisture levels (b) for 2081-2100, relative to 1986-2005. Image source: Intergovernmental Panel on Climate Change’s 2014 synthesis report. Humans will have more breathing and heart problems as higher temperatures produce ozone and other toxic particles. As moisture levels are likely to vary between regions, some populations may be exposed to more chemicals, leading to more allergies and toxicities. And since toxic chemicals can suppress the immune (microbial defense) system, we may fall sick more easily and more often. The elderly, children, those with existing health problems, and the poor (due to limited resources and insufficient medical care) are most likely to be affected. Scientists expect hotter weather to increase the amount of chemicals organisms take in, store, break down, and eliminate. As many wild species cannot regulate their own body temperature, they will experience higher physical stress from climate change. This will make them more vulnerable to toxic chemicals. Their exposure to chemicals may also prevent them from adjusting to the altered climate. As with humans, their immune system may get weakened and they may get sick more easily and more often. Climate change will cause sea levels to rise, and this could lead to freshwater rivers and lakes getting contaminated with salt water. Salt prevents chemicals from dissolving effectively in water, and chemicals become free to enter organisms’ bodies in higher concentrations. Species with low population numbers or those that can survive only under certain conditions, are more likely to be affected. Also, if a species at the bottom of the food chain is killed or contaminated due to chemicals, species relying on them for food will also be affected. While many more studies need to be done before we can confidently make a conclusion, it seems likely that climate change will increase human and wildlife’s exposure to harmful chemicals. Also, the combined stress of dealing with a changing climate and a harmful chemical may make living organisms more vulnerable to the chemical’s effects.